Getting back to the issue of his use of language, however, I soon realized where the writer was really coming from. He decried the appointment of Stephen K. Bannon to a position as permanent member of the NSC. In the view of the author, Mr. Bannon, who is a member of Breitbart News Network, does not "deserve" to be a member of the council because, as he put it, "Mr. Bannon, with his racist, misogynist and Islamophobia perspectives...has no business being a permanent member of the most powerful consultative body in the world." Obviously, that statement shows you where I'm going with this. It is a sad sign of our current generation that one side of the political spectrum seems to have a tremendous blind spot for its own failings. When you read the statement I quoted above, what comes to your mind? If you're on the left side of the spectrum, you will likely not think much about it other than that Mr. Bannon is someone on the "extreme right" and he shouldn't even be given the time of day. But if you're a thinking person who has a biblical worldview, you will quickly realize what the author is doing with his use of language. First of all, writers are often taught that the words they choose to use will give their articles a particular impact. If you want to appeal to emotions, then use words that will solicit that reaction. If what you want is to insult, well then use words that will do that. All this, however, will be done in a subtle way that, if you're not paying attention, will solicit a particular reaction while at the same time doing so in the shadows. And that is where this author's use of the words above come into play. What does this person mean by racist, misogynist and Islamophobia? That is the question we need to ask since, especially in this article, those are words that often go unexplained simply because the writers often understand that their readers will decipher the code. Allow me to decipher it for you in case you may not understand it or you may not be one of those in the “know.” To those on the left, the use of the term racist doesn't mean what you think it does. When those of us with a Christian worldview think of racism, we think of those who, because they consider themselves superior due to their particular race, oppress, suppress or hold down those who are of a different race. And this is all done simply because of their particular race, without regard to their other qualities. Thus, in the most extreme cases, we think of someone such as Hitler who, because of his belief in the superiority of the Arian race, exterminated millions of "unworthy" others. Or slavery in the US south where being black meant that you were necessarily inferior to the whites then inhabiting the land. This is not to say that there are more subtle forms of racism. But even that is not what we're discussing here. To the leftist--to whom such actions are of course racist, but who nevertheless have a much broader definition of the term--what that word means goes much further and includes ideas that, if you don’t have the “right” indoctrination, you would never think are racist. In this context, then, racism simply means that the person being accused of such behavior is probably against Affirmative Action, or he disagrees with quotas based on race, etc. Thus, to be a racist in the distorted view of the leftist mindset, is to be for, as recently retired economist Thomas Sowell would put it, equality based on abilities, intelligence and potential. If you are to escape the racist label, then you have to agree with quotas, preferences and other "remedies" that our society has conjured up in order to try and redress the mistakes of the past. Unfortunately, when you have a corrupted society trying to fix the corruptions of the past, the result will be more and worse corruption. What about the accusation of being misogynist? No need to go too much in depth here, since that accusation today is usually based on being against abortion. Of course, to our society at large, if you're against abortion that means that you're somehow against women and their progress. Our society's sacrifice to Moloch has become a sacred cow which, if you oppose, you will be tarred and feathered as the worst that humanity has to offer. The need to explain the Islamophobia meme is obviated in light of what I said above. Let me simply say that to be guilty of Islamophobia is to be against radical Islam or to call Islam for what it is, a false religion that has enslaved millions and that even now is sending many to eternal destruction. 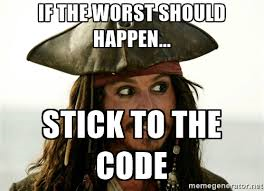 So, the next time you read an article written by someone you know to be left of center, be careful that you do not overlook the “code” imbedded in it. If you do, you may find yourself agreeing with the author when in reality nothing they say actually agrees with your worldview.